What’s the virtual candy jar? Years ago my friend, mentor and boss introduced me to the simple wonders of the candy jar effect. If you have a jar, basket, drawer, etc always supplied with candy, people across the organization will come to you. This is a great and super easy way to find out what’s going on in other parts of the organization, and with people in general. It also helps you develop an idea of what they like, so you can come bearing gifts when you need some assistance. That said, I haven’t worked in an office full-time since 2008. With that in mind, I try to make sure i’m extra communicative. But, what about everyone else? 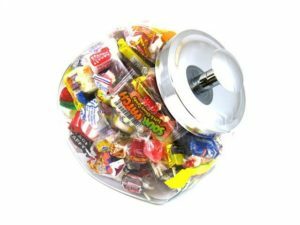 Flexible work schedules are becoming more and more the norm, so how do you keep pulse on the organization and obtain all that knowledge you would have gained had you been in the office with a candy jar? I have two separate thoughts on this spanning both sides of the spectrum. On one hand, I would argue that the people who are most effective in working remotely are often times their own “candy jar.” In my case, I find that people come to me with questions because they believe I have something to contribute. This allows me to get some of that additional information and continue to foster those connections outside of the immediate people I work with day in and day out. But not everyone does a great job working remotely. I have had team members who were extremely difficult to figure out. Even the basics of determining exactly what they were working on, or how a project was progressing was difficult to ascertain. In this situation, I tried the daily stand up call. That helped a bit, but that was all the communication I got in the 24 hour period, unless I initiated it. An additional problem with the daily stand up call is that it gives you insights into the very specific yesterday’s work, today’s work and any roadblocks but doesn’t necessarily allow you to get a pulse on how the person is feeling. As a manager, I think it’s my job to know what’s going on with my team. As a project manager, you may not be responsible for the team members but it’s still important for you to know the general pulse of the team. But in lieu of a better option, I think I’m stuck with doing my part to check in and ask. I’d love to hear if you have better suggestions. What’s your virtual candy jar? Global project teams happen more often than not these days making it no longer feasible to get everyone in a room to facilitate a project. As a Project Manager & leader for both global team members and global customer teams, I’ve experienced the added complexity of this on my projects. 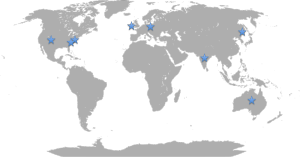 A LiquidPlanner blog post by Tim Clark from October 2013 “7 Tips for Managing a Global Project Teams” highlights time zones, cultural, religious, and sociological differences. Mr. Clark also recommends staying on top of advances in software solutions to simplify the process. Inc. published “5 Tips to Manage a Team Across Multiple Time Zones” by Will Yakowicz in July 2014, which also had very applicable information. Mr. Yakowicz reminded us that we can’t work 24 hours/7 days a week, emphasizing a consistent schedule. He also encouraged us to leverage the latest technology, invest in airfare to facilitate team cohesion while also recognizing that we must be extra aware of those people who aren’t sitting in the same room as us. In my experience, there are a few additional key considerations for successfully managing global teams. Be Flexible – As the project manager, it was my responsible to facilitate the project. Some things do just get lost in translation over email, and it’s necessary to have a phone or video session. Unfortunately, it’s not all about me, therefore it can’t be all about my time zone. I often had calls in the early morning or late night to coordinate with Europe (EMEA) or Asia (APAC) as required. Be Available – When you have remote teams, it is imperative for each team member to be more communicative than would be required if everyone was in the same place. I can’t hover at someone’s cubicle when they are based in Ireland, but I can make myself as available as possible, as well as encourage each of my team members to do the same, on any mediums used by the respective regions. Diligently Break Down Barriers – Communication is hard. It’s even harder when you’ve never met a person, other than via email or phone. More often than not, when you are driven to a phone call it’s to resolve an issue. I encourage you to take the time to introduce yourself and chat. By learning the personality traits, and what drives your team, you will be better able to motivate them. Managing global teams is difficult. The pace of project delivery, technological advances and life adds to the complexity. However, it is the new normal. We’ll need to step up our game to learn to do it well.